Exercise for depression is one of the best natural depression remedies. Have you seen what we are doing so far? We are building a set of habits that would make anybody a better person. These are healthy habits that you are doing, not because you are depressed, but because you want to enjoy life. This must be true or you wouldn’t be reading this now. The body is connected to the mind. The better we take care of the body, the better we can enjoy life. Learn about the mind and body connection here. Exercise has a way of complimenting, and even boosting the effects of the other depression help techniques. Here's what I mean. Interrupt The Body’s Response To Depression. Exercise fills the body with energy, effectively interrupting the depressed hunchback syndrome, the sleepiness, low level energy, and other debilitating depression symptoms. Cleanse The Body. Exercise increases blood flow cleaning all the stress toxins in our body that help trigger depression. Support Nutrition. Fitness regulates the body's metabolism. When we exercise, the body craves healthy foods, but we have to ensure you feed yourself lots of healthy, nutrition rich food for your new healthy body. Especially eat lots of fruits and vegetables to feed and help your body and mind. Boost Self Esteem. Working out makes us look younger and healthier. This is a fact. As an example, look at all the makeover shows. A big part of making somebody look younger and better looking is with exercise. Have you noticed at a gym how people look at themselves in the mirror? That’s because working out betters the body, and lifts the spirit. And why not admire your own healthier body? It’s a wonderful thing. Anaerobic fitness is used to promote strength, speed and power. Anaerobic examples are strength training with weights, and short distance running. Aerobics fitness intends to improve the oxygen system. Aerobic means "with oxygen", and refers to the use of oxygen in the body's metabolic or energy-generating process. NOTE: Consult your doctor before you start any exercise for depression program. Here's what I recommend you do for your exercise for depression self help program. Combine Aerobics and Anaerobic Exercise. Follow a routine of strength exercise, such as weight training, followed with at least 20 minutes aerobic training, such as brisk walking, jogging, biking, treadmill, etc. Consider Joining a Gym. Joining your local gym can give you an incentive to continue your exercise program. Ask the gym trainer to set up a strength training and aerobics plan. Remember, we need a strong body, as well as strong lungs and heart. Do both types of training--daily if possible. Consider A Home Gym. If you can not, or do not want to join a gym; no problem--you can set up a gym at home. You do not need all the gadgets a gym has. You only need a few key items to have a full gym at home. 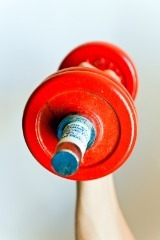 One of my favorite websites for at home workouts is www.scoobysworkshop.com. Although I do go to the gym, I follow his program because I have found it to be the best all-natural fitness website. I do not get any commissions from this website. I simply find it has the best and healthiest fitness programs, and I am happy to recommend it. Anaerobics, strength training as little as three to four times a week. Aerobics should be at least 20 minutes, five days a week. So there you have it. Exercise your way into health and be depression free. Exercise is a very important step in the treating depression. Follow this depression self help natural remedy, and you will be depression free, and healthier than ever before.